Hypertension or high blood pressure, as it is more commonly known, is regarded as a silent killer. It is a disease of the modern age. The fast pace of life and the mental and physical pressures caused by the increasingly industrialized and metropolitan environments have a role to play in the rise in blood pressure. The heart is responsible for pumping blood through the arteries to the various organs and parts of the body. The pressure that is exerted on the walls of the arteries with the passage of blood is what is defined as blood pressure. Blood pressure is measured with an instrument called sphygnomanometer in millimeters of mercury. The highest pressure reached during each heart beat is called systolic pressure, and the lowest between two beat is known as diastolic pressure. Most young adults have blood pressure around 120/80. It increases normally with age, even going upto 160/90. Hypertension is commonly referred to in the media as the silent killer with good reason. The condition often causes no discernible symptoms, causing a large number of fatalities as it is often detected too late. While hypertension or high blood pressure may not be a direct cause of death it could lead to a number of complications and long term diseases that often prove fatal. High blood pressure can afflict anyone past the age of thirty, with the risk increasing as we age, although it could also afflict young adults at times. It is in fact estimated that up to sixty million Americans may suffer from high blood pressure. Awareness about the risk factors and the symptoms of high blood pressure is of great importance as the only effective way of managing high blood pressure is through preventive measures and early detection. Being able to recognize high blood pressure symptoms can literally make the difference between life and death. High blood pressure can be treated effectively and controlled with medications and lifestyle modifications. Treating high blood pressure should not be taken lightly however and your doctor’s instructions should be followed meticulously. Attempts at controlling high blood pressure naturally are ill advised. High blood pressure cannot be cured permanently and a reduction of high blood pressure symptoms should not be taken as a sign to stop treating high blood pressure. Similarly, patients should not attempt self medication or high blood pressure treatment solely with natural treatments for high blood pressure and lifestyle changes. Medical attention is necessary and regular checkups are of great importance especially when detected with the condition. Uncontrolled or poorly treated high blood pressure can cause a variety of complications including heart attacks, kidney failure, strokes and peripheral artery disease among others. The risk of succumbing to a heart attack is in fact directly connected to high blood pressure. The higher your blood pressure the higher the risk. Managing high blood pressure naturally with diet changes may be necessary during pregnancy if medications do pose a risk to the mother or child. This of course depends entirely on the advice of your doctor and should not be a decision you make single handedly. The first symptom of hypertension may appear as a pain at the back of the head and neck on waking in the morning, which soon disappears. There is no variation in high blood pressure symptoms in both men and women or even during pregnancy, and treatment solely with home remedies is always advised against. It cannot be stressed enough that high blood pressure symptoms may not always be apparent. Although common high blood pressure symptoms like headaches, dizziness and vision problems are likely to occur; most people do not notice or suffer any high blood pressure symptoms. The condition therefore often goes undiagnosed as most people lack the motivation to visit a doctor in the absence of any worrying symptoms. It should be kept in mind that irrespective of your health status, lifestyle and fitness regular checkups are advisable for anyone past the age of eighteen. The main causes of high blood pressure are stress and a faulty style of living. Smoking and an excessive intake of intoxicants, tea, coffee, and refined foods destroy the natural pace of life and prevent the expulsion of waste and poisonous matter from the body. 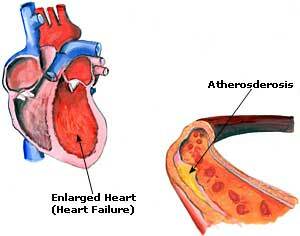 Hardening of the arteries (atherosclerosis), obesity, and diabetes lead to hypertension. Other causes of high blood pressure are an excessive intake of common table salt, and eating a high fat and low fibre diet. In most cases of high blood pressure causes of the condition remain unknown. Irrespective of the high blood pressure causes treatment can be provided to minimize the ill effects of high blood pressure and relieve high blood pressure symptoms like anxiety and headaches. Although there may not always be specific causes of high blood pressure it is undeniable that there are certain conditions that could contribute to or significantly increase the risk of developing high blood pressure. While not all of these factors are controllable, awareness about them does make us conscious of the existence of the risk of high blood pressure, and consequently keeps us alert to the warning signs. The practice of breathing exercises, switching to specific diet foods, and herbs or supplements can help lower blood pressure naturally. Age: This is one of the biggest risk factors for elevated blood pressure levels and as you age the risk of developing high blood pressure keeps increasing. In the past the age group affected may have been higher, but with the changes to our lifestyle and increased stress levels, pollution and unhealthy diets high blood pressure has also begin to affect younger adults, which is why it is best to start going for annual checkups after the age of eighteen. Diet: Diets with a high fat content are one of the major causes of high blood pressure. A high blood pressure diet plan or chart will always exclude foods like red meats, junk foods, and other fried or refined foods. There are plenty of healthy alternatives and you can prepare your own high blood pressure diet menu, with recipes for high blood pressure from internet resources. Most of the foods that cause high blood pressure are the ones that are high in sugar content, hydrogenated oils and trans fatty acids. Salty foods, fatty dairy products, greasy and deep fried foods and fatty meat products should all be avoided or eaten sparingly to avoid high blood pressure problems. Stress: The relationship between stress and high blood pressure cannot be understated and its contribution to increased incidence of the condition in modern society is undeniable. Stress related disorders are on the rise because increasing levels of competitiveness and tremendous technological growth that has changed the urban and social landscape. This stress could either be emotional stress or even physical stress in the individual. Racial Factors: African Americans are believed to be at a higher risk of developing high blood pressure as compared to Caucasians and this is also likely to occur earlier in life and cause complications of greater severity. Socio-Economic Status: Although high blood pressure may be uniformly prevalent across all sections of society, the less educated and lower socio-economic groups may be more affected because of a lack of awareness and also a lack of access to quality diets. Heredity: This is another factor that cannot be controlled and people with a family history of high blood pressure are predisposed to developing the condition. Gender: Men are generally thought to be a lot more likely to develop high blood pressure as compared to women, but this could vary in different populations. While all of these factors may be uncontrollable there are some things that we can control. Body Weight: Obesity is known to be one of the biggest risk factors for developing high blood pressure because blood pressure rises with increasing weight. It is highly advisable for anyone who is overweight to attempt to reduce some weight through healthy methods like dieting and working out. Patterns of weight gain are also believed to indicate the risk of obesity to some extent as those who gain weight mainly around the abdominal area are at higher risk, while those who gain weight on the hips and thighs, although at risk would not be as susceptible. Salt: Some individuals have greater sensitivity to sodium and the consumption of salt will therefore cause a rise in blood pressure. In such a scenario, simply cutting down on salt intake would lower blood pressure naturally. High blood pressure diets are typically low in salt. Alcohol Consumption: Excessive alcohol consumption is also known to raise blood pressure levels, particularly in those sensitive to alcohol. Medications and Contraceptives: Women who have been on contraceptive pills may be at increased risk of developing high blood pressure and the use of certain medications like diet pills or amphetamines could also contribute to the problem. Indian gooseberry is another effective remedy for high blood pressure. A tablespoon each of fresh indian gooseberry juice and honey mixed together should be taken every morning in this condition. Potatoes, especially in boiled form, are a valuable food for lowering blood pressure. When boiled with their skin, they absorb very little salt. Thus they can form a useful addition to a salt-free diet recommended for patients with high blood pressure. Potatoes are rich in potassium but not in sodium salts. The magnesium present in the vegetable exercises beneficial effects in lowering blood pressure. Parsley is very useful in high blood pressure. It contains elements, which help maintain the blood vessels, particularly, the capillaries. It keeps the arterial system in a healthy condition. It may be taken as a beverage by simmering 20 gm of fresh parsley leaves gently in 250 ml of water for a few minutes. This may be drunk several times daily. Among the herbs, rauwolfia is the best remedy for high blood pressure. Alkaloids of this drug, which have a direct effect on hypertension, have been isolated and are being widely used by practitioners of modem medicine, but they have certain unpleasant side-effects which the drug, taken in raw form, does not have. Practitioners of the Indian system of medicine have, therefore, preferred to use the root of the drug in a powdered from. Half a teaspoon of this drug, taken thrice a day, is very effective in hypertension. Raw vegetable juices, especially carrot and spinach juices, taken separately or in combination, are also beneficial in the treatment of high blood pressure. If taken in combination, 300 ml of carrot juice and 200 ml of spinach juice should be mixed to make 500 ml or half a liter of the juice, and taken daily. If taken separately, one glass should be taken twice daily, morning and evening. Recent studies have revealed an important link between dietary calcium and potassium and hypertension. Researchers have found that people who are on potassium-rich diets have a low incidence of hypertension even if they do not control their salt intake. They have also found that people with hypertension do not seem to get much calcium in the form of dairy products. These two essential nutrients seem to help the body secrete excess sodium and are involved in important functions which control the working of the vascular system. Potassium is found in abundance in fruits and vegetables, and calcium in dairy products. Many herbal practitioners use Hawthorn for reducing high blood pressure risks naturally. Hawthorn supplements or extracts can be taken consumed under medical supervision to control high blood pressure. This particular herb does not have any known negative interactions with other drugs used for high blood pressure. The Chinese Hawthorn fruit is also beneficial in improving heart function, repairing heart muscle damage and dilating the heart blood vessels to enhance blood flow. Diabetics who suffer from high blood pressure can take a daily dose of Hawthorn extract to reduce high blood pressure naturally. Fish oils supplements contain eicosapentaenoic acid (EPA) and docohexaenoic acid (DHA) both of which can reduce high blood pressure naturally. Daikon seed extracts have been widely used in herbal medicine for a variety of purposes. Daikon seed extracts not only help in lowering high blood pressure risks but also help in maintaining overall cardiovascular health. Holly leaf also known as Ilex aquifolium helps in enhancing blood circulation by expanding the blood vessels and also simultaneously reduces cholesterol in the body. Therefore this herbal remedy is great for controlling high blood pressure and also keeping the mind calm. Flaxseed is very rich in fiber and therefore very effective in lowering LDL cholesterol and preserving HDL cholesterol. Flaxseeds should be consumed regularly along with soups, cereals and yogurt in order to reduce high blood pressure. Persons with high blood pressure should always follow a well-balanced routine of a proper diet, exercise, and rest. Diet is of primary importance. Meat and eggs, more than any other food, cause the blood pressure to rise. The pressure can be lowered and blood clotting diminished by increasing the consumption of fruits, reducing protein intake, and sticking to a vegetarian diet. A natural diet consisting of fresh fruits and vegetables instead of a traditional diet, helps to get rid of the toxins from the body. Salt should be avoided; in any case, it should not exceed more than three grams or about half a teaspoon per day. Supplements of minerals or vitamins for high blood pressure control may also be recommended. Persons suffering from hypertension must get at least eight hours of good sleep, because proper rest is a vital aspect of the treatment. Most important of all, the patient must avoid overstrain, worries, tension, anger, and haste. He or she must develop a calm and cheerful attitude and develop a contented frame of mind.